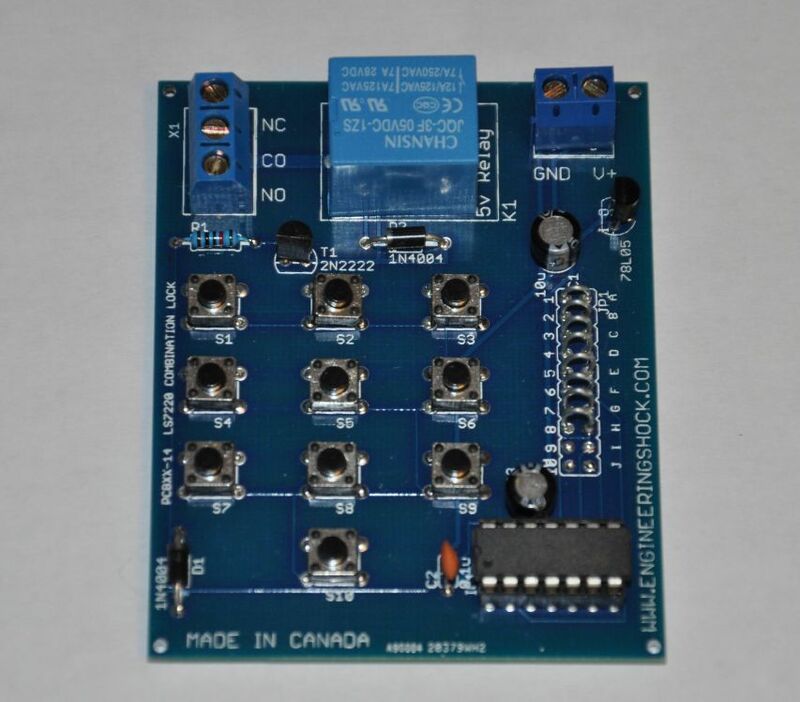 This listing is for a combination lock kit based on the LS7220 combination lock IC. The data sheet can be found below. The LS7220 IC requires that you hard-wire in your own 4-digit code. The above video gives you all of the information that you need to know. It includes assembly instructions, code wiring instructions, a demonstration of functionality and a demonstration on how to control AC/DC devices with the on-board relay. When you build this kit, you solder all of the components into place, at which point you create your own 4-digit code by hard-wiring the four digit code into the wiring slots on the right hand side of the board. When the user enters the right sequential code, the on-board relay activates for roughly 4.5 seconds, at which point the relay turns off, and the device starts scanning for another correct sequential code entry. The length of time that the relay is on for is determined by an on board timing capacitor. You can substitute the included 10uF capacitor with a smaller value for a shorter relay activation time, or a larger value for a longer relay activation time. See the data sheet for more information. 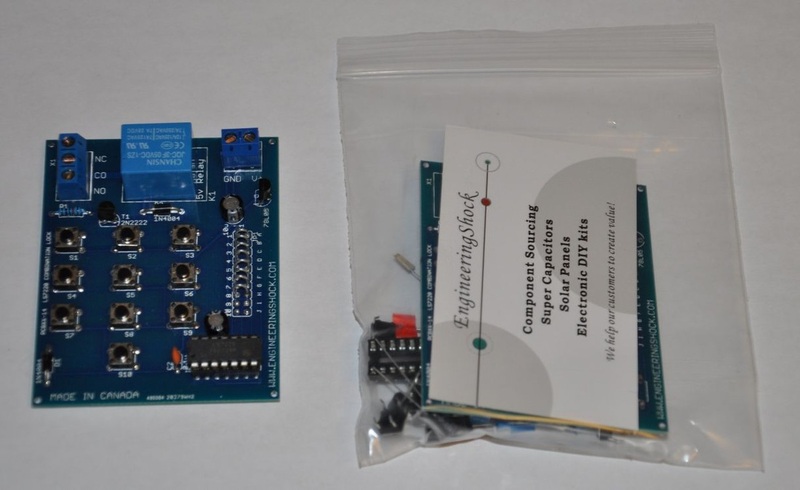 The kit comes with a custom printed circuit board and all of the components required to complete this kit as seen in the video. No hard copy of the instructions are included with this kit. The schematic diagram and the PCB diagram can be found below, along with a link to the data sheet. The video acts as your instruction manual. It will show you how to build and use this device from kit form to final product. 1) A power supply of 7v to 10v. You can use a wall wart or a 9v battery. If you're looking to use this for a long period of time, consider looking for a wall wart with an output voltage of 7v-10v @ 200mA Minimum. 2) Basic soldering skills and previous DIY kit building experience is helpful. 4) A good understanding of the dangers of AC power. DO NOT CONNECT THIS DEVICE TO AC POWER UNLESS YOU KNOW WHAT YOU'RE DOING! I TAKE NO RESPONSIBILITY IF YOU END UP HURTING OR KILLING YOURSELF WHEN WORKING WITH AC POWER! 5) About a half an hour to put the kit together. Follow along with the assembly instructions in the video! 1) You can use the relay to switch either DC or AC voltages. If you are working to turn on and off AC devices, make sure that you're not going to kill the traces. The traces for this kit along the relay lines can handle about 120VAC @ 2A, or 12VDC @ 4A. The relay itself can handle more power, but you have to keep the PCB traces in mind. Don't try to connect power your microwave with the relay, as it requires a TON of power.. A small TV, or an LCD can be easily turned on and off. Or perhaps a lamp, or an electromagnet. A DC solenoid or motor can be activated using this relay as well. 2) When soldering the buttons into place, make sure that they are flat against the board when you solder. You don't want to turn the board around after you've been soldering only to realize that the buttons are not flush against the board. It just doesn't look nice! 3) Make sure that you place a healthy amount of solder on the terminal block pads, and the relay pads. This will ensure a strong connection. 4) Be patient, and follow along step-by-step with the video, and you won't have any problems!